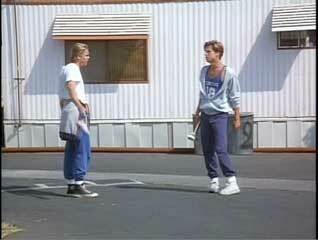 Ricky Schroeder and Brad Pitt wear black and white high top Converse “Chuck Taylor” All Stars in the film. Ricky Schroeder and Brad Pitt play rival brothers in Across the Tracks. Across the Tracks is the story of two brothers who have gone very different ways in their past, and who now must learn to deal with each other again. Joe (Brad Pitt) is the older of the two, and has lived the straight life. Joe is a good student and runner and is set on winning a track scholarship to Stanford University. Billy (Ricky Schroeder) has been a delinquent, involved in drugs and crime, and as the movie begins, has just been released from reform school after serving time for a failed car theft attempt. While Billy tries to make amends for his past life, it isn’t an easy task. Joe still holds a lot of resentment for what Billy has put their widowed mother through, and feels that Billy’s return is an unnecessary strain on their family. Forced to attend another high school on the other side of town, Billy tries to stay out of trouble but his old rivals force him into a fight on his first day, which gets him into trouble with the school authorities. Another friend, Louie (David Anthony Marshall), a young drug dealer who was also involved in the car theft that got Billy sent to reform school, wants him to return to his slacker ways of before. It seems that the only person who still believes that Billy can become a valuable member of society and offers him full support is his mother (Carrie Snodgrass). Billy warms up for a track race tryout. One day Joe suggests to Billy that he try out for his school track team, figuring that nothing will come of it. Nevertheless, Billy goes out asks the coach at his school for a tryout. Billy hardly looks like a track star in his black high top chucks and greased back long hair, but during the tryout demonstrates surprising speed, and the coach immediately puts him on the team. Joe is very much impressed by this, and the two start to bond, especially after Joe goes out and buys him a special pair of track shoes. But Billy’s speed soon makes him a contender for the county record, and ironically (since he attends a rival school to Joe’s) pits him against Joe in a big meet which will determine whether or not Joe receives that scholarship to Stanford. Now the pressure is on Joe to prove that he is the best runner in the county, and Joe has trouble handling the competition. The outcome of this dilemma and the determination of Billy’s low life friends to get some revenge for Billy’s abandoning them for the straight life all come together toward the end of the film, which focuses on how the two brothers attempt to overcome the adversity caused by these outside influences and solidify their relationship with each other. Billy and Joe will face each other in a big race. Across the Tracks is an interesting film, mainly because it is the first major film appearance by both Brad Pitt and Ricky Schroeder. You begin to see the potential star-quality of Pitt in this film, where he portrays the perfect son and perfect athlete whose life is challenged by the return of his younger brother and the competition that he represents both at home and on the athletic field. Schroeder’s appearance in the film represents one of the first real stretches in his career, which up to this time was mostly noted for his appearance on the situation comedy Silver Spoons. In his role as Billy, we see Schroeder both as a short-tempered teenaged rebel willing to embrace a life of drugs and crime, and then as the prodigal son, returning home to try to put the pieces of his life back together. While much of the story line is the stock material of teen coming of age films, these performances by Pitt and Schroeder are significant because they are an early example of their dramatic capabilities as actors. Billy tries to persuade an inebriated Joe to not give up his track scholarship dream. Hey Billy, these chucks are made for running! 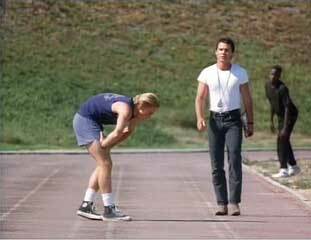 Throughout the film Rick Schroeder in his role as Billy wears black high top chucks, and he even wears them during much of the time that he is running track. 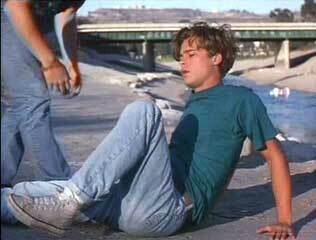 (again reminding us that chucks are great shoes for many sports) Toward the end of the film Brad Pitt also wears white high tops in several of the scenes. Probably the best scenes for close-ups are when Billy is just hanging out at home. Billy’s mom stands by him during his probation from juvenile hall. Across the Tracks. (1991) Rick Schroeder, Brad Pitt, Carrie Snodgress, David Anthony Marshall. Directed by Sandy Tung.